The Sakya school is one of the main traditions of Vajrayana Buddhism from Tibet. 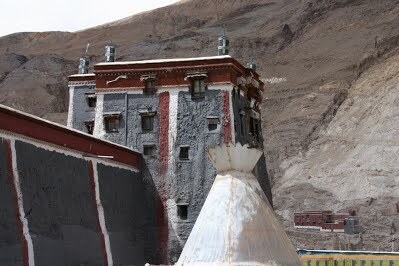 The school was founded in 1073 CE when Khön Konchog Gyalpo built the school’s first monastery in Sakya, Central Tibet. The Khön family had been practising the earlier transmission of secret mantra when Khön Konchog Gyalpo became a disciple of Drogmi the translator. From Drogmi Lotsawa, he received new translation teachings, in particular, the Mahasiddha Virupa’s Lamdre, or ‘Path with the Result’ teachings, based on the Hevajra Tantra. Khön Konchog Gyalpo’s son Sachen Kunga Nyingpo (1092-1158) collected and organised many sutra and tantra teachings from the translators coming from India. The school fell under the successive leadership of Sonam Tsemo, Jetsun Dragpa Gyaltsen, the renowned scholarSakya Pandita, and Chogyal Phagpa, who are collectively known as the five founding fathers. Sakya Pandita and Chogyal Phagpa tutored the Mongol Khans and were granted political rule over Tibet. Not unlike other traditions of Tibetan Buddhism, there are other sub-traditions that emerged. The three sub-traditions are namely the Ngor, after the abbot Ngorchen Kunga Zangpo (1382–1456), the Tsar, after Tsarchen Losal Gyatso (1502-1566) and the Dzongpa, after Dorjedenpa Kunga Namgyal (1432-1496). The current supreme leader of the Sakya tradition is His Holiness the 41st Sakya Trizin. He and his family currently reside in Dehradun, India. He has two sons, His Holiness Ratna Vajra Rinpoche and His Eminence Khondung Gyana Vajra Rinpoche. All three travel widely to give teachings and empowerments to students in centers around the world. His Holiness Khondung Ratna Vajra Rinpoche, the eldest son of His Holiness the 41st Sakya Trizin, is considered one of the most highly qualified lineage masters of Tibetan Buddhism. Renowned for his erudition and the clarity of his teachings, Rinpoche belongs to the prestigious Sakya Khön family, whose successive generations have provided an unbroken lineage of outstanding masters. Born on 19th November, 1974 in Dehradun, India, His Holiness was, from birth, the recipient of countless blessings, empowerments and teachings from His Holiness the 41st Sakya Trizin as well as many other learned and accomplished masters. Rinpoche’s formal education began when he was six years old, under the tutorship of Venerable Rinchen Sangpo, with the study of Tibetan reading, writing, grammar, memorisation and recitation of basic prayers and rituals. In 1987, when His Holiness was twelve, he passed his first major examination at the Sakya Centre in Rajpur, Dehradun. Two years later, he completed his basic studies of the major rituals and scriptures of the tradition. In 1990, Rinpoche joined the Sakya College where he studied mainly Buddhist philosophy under the late Khenpo Migmar Tsering. In 1998, after years of rigorous training, His Holiness completed his studies there and was awarded the Kachupa degree, “master of ten scriptures“. In addition to his philosophical studies, His Holiness received many exoteric and esoteric teachings, empowerments, blessings, initiations, oral transmissions, explanations and pith instructions, mainly from His Holiness the 41st Sakya Trizin, and also from many other important lineage masters, including His Holiness the 14th Dalai Lama, His Eminence Chogye Trichen Rinpoche, His Eminence Luding Khenchen Rinpoche, and Khenchen Appey Rinpoche. Starting from the early age of twelve, His Holiness has completed numerous meditation retreats, including the rigorous and complete Hevajra retreat, one of the prerequisites for bestowing the Lamdre empowerments. Among all his precious teachers, His Holiness the 41st Sakya Trizin has always been, and continues to be, his main Root Guru and source of guidance and inspiration. In 2002, after a long search for a suitable wife, Her Eminence Dagmo Kalden Dunkyi, was chosen, in the age-old Sakya tradition of holy divination, to be the spiritual consort of His Holiness. They have three children together, who are also being brought up in accordance with the ancient Buddhist traditions of scholarship. With wisdom and compassion, His Holiness continues to regularly transmit numerous empowerments and teachings at renowned Buddhist institutes such as the Sakya Institute, the Dzongsar Institute, Sakya College, Tantric College, International Buddhist Academy, and countless other schools, centres, and monasteries all over the world. In 2017, His Holiness will inherit the mantle of leadership from his esteemed father and Root Guru, in his new capacity as His Holiness the 42nd Sakya Trizin of the Sakya tradition of Tibetan Buddhism. In doing so, he will continue to guide and inspire Dharma students from all over the world with his wisdom, genuine qualities of unaffected simplicity, humility and complete honesty, by presenting the Buddha’s teachings in the most authentic way, while maintaining the purest of Buddhist traditions.